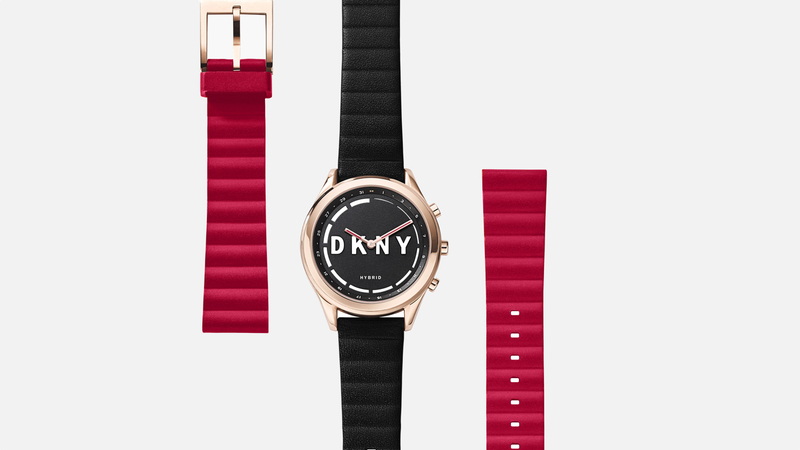 The DKNY Minute has finally been given a release, having initially being announced at Baselworld back in March. The hybrid smartwatch is available online starting from $155, and also represents the first piece of wearable tech from the New York-based fashion house. Clearly an everyday women's watch, the Minute will come in three styles. The rose gold finish shown above, as well as the white/gold and black/silver model shown below. The standard, leather straps will also come interchangeable, with the trio of styles accompanied by a quilted pinstripe silicone strap. The case size is 38mm, meanwhile, while the lug itself will sit at 18mm. There's no touchscreen, of course, with the DKNY hybrid instead just tracking activity and sending data to iPhone and Android phones via Bluetooth. As with its Fossil Group siblings, the Minute will also vibrate to alert the wearer of phone calls, messages and apps notifications. There's three 'pushers' (physical buttons) on the right hand edge of the watch and these will be customisable via the app, too. So, you can assign these to functions like take a selfie or control music via your smartphone. This is the only real new feature that Fossil Group added to its licensed designer hybrid lines this year, with the focus seemingly about keeping things simple and offering a smorgasbord of different styles. While this pretty much wraps up the wares that Fossil Group debuted at Baselworld earlier this year, don't expect this train to slow down any time soon. We already know the wearable maker is looking to add more fashion brands to its pack in 2018, though whether they will launch hybrid options like the Minute or full touchscreen designs like the Emporio Armani Connected or Michael Kors Access Grayson remains to be seen. Stay tuned.